Having 35-years of credits to his name, Vincent D'Onofrio is a wealth of acting knowledge. His time on the main stage at C2E2 in Chicago was spent talking about his methods, his career, and how he gets into each role. While some keep him front of mind from his iconic role of Pvt. Leonard 'Gomer Pyle' Lawrence from Full Metal Jacket most in attendance wanted to know more about Wilson Fisk from Daredevil. D'Onorfrio spent a good amount of his time talking about the hit Netflix TV series and said that even though Wilson Fisk is made to be the villain in Daredevil, he doesn't feel like he's playing a baddie. "Stephen DeKnight's writing -- how he and his team wrote the first season -- the writing was so good it immediately sparked that kind of feeling inside me this was an emotional person," D'Onofrio said. "This had nothing to do with playing a bad guy." According to D’Onorfrio the complex emotions that made up his character also helped in creating his very distinct voice. "His voice, in particular, is distinct and that came up through an emotion that I was playing with as an actor," he said. "So I constantly speak through that emotion; so that's how Fisk's voice came." Most actors and actresses are very hesitant to talk about their acting processes in fear of it getting stolen by competing actors, but for D’Onorfrio he was afraid it would be a boring conversation. It took some encouraging -- if not relentless -- cheers from the crowd at C2E2’s main stage for D’Onorfrio to expose some insight into his acting process. D’Onorfrio added that he wants to create the same mood that the director, producer, and writers envision. “So when I know that happens then I start to let ideas come in that I think might stick or might not," he said. He added that only about 20-percent of the ideas he thinks of ever make it to the set. One of the roles that broke that process for him was the role of Edgar in Men and Black. According to D’Onorfrio, when he received the script for Men in Black he was told not to talk to the director Barry Sonnenfeld about acting or how to play his role at all. D’Onorfrio is currently working on a few projects including The Kid a movie about a young boy who witnesses Billy the Kid's encounter with Sheriff Pat Garrett, and the recently announced movie called A Fall From Grace which is about a detective trying to solve a string of murders in his city. 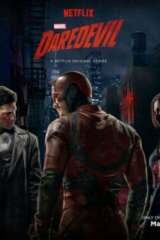 Daredevil Season 3 is scheduled to hit Netflix sometime in 2018.